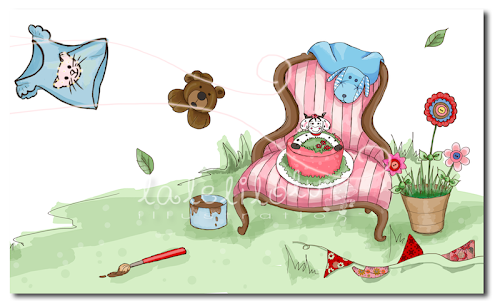 The illustration should show all the beautiful things Fernanda makes: cupcakes, candies, crafts and even furniture restoration. I had no idea how to put all those things spatially, just knew I didn’t want it to be crowded or chaotic. Then came my inspiration: the wind. What could be a better way to gather so many things with lightness and harmony? And this is how it came out. 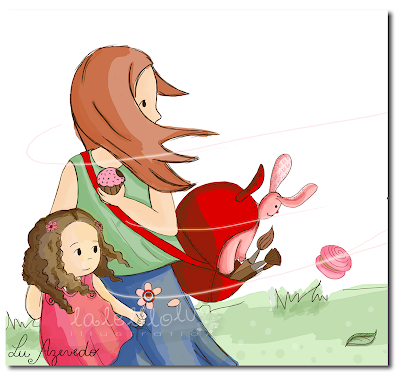 The illustration shows everything that Lulu’s mom makes being carried away by the wind and falling nearby a chair she just restored. To visit her new blog, please click HERE. Also, don’t miss the opportunity of looking at this post HERE where Fernanda posted every step of the illustration I sent to her and shows a little bit how we chose the colours and things to go in the illustration. Bom, sou suspeita já pra falar de você, né, Lú? E vem cá: que fotos lindas aquelas suas no site!! Maravilhosa! Obrigada mais uma vez, e espero poder te agradecer pela terceira, quarta, quinta, sexta…….enfim, que venham mais inspirações!! Lú, parabéns! Mais uma vez você arrasou, mas confesso que fiquei com uma invejinha branca da mãe da Lulu. Continuo aguardando a minha vez. Fe, se houverem proximas, vamos torcer pra que pelo menos não venham com a tal da insonia, né?